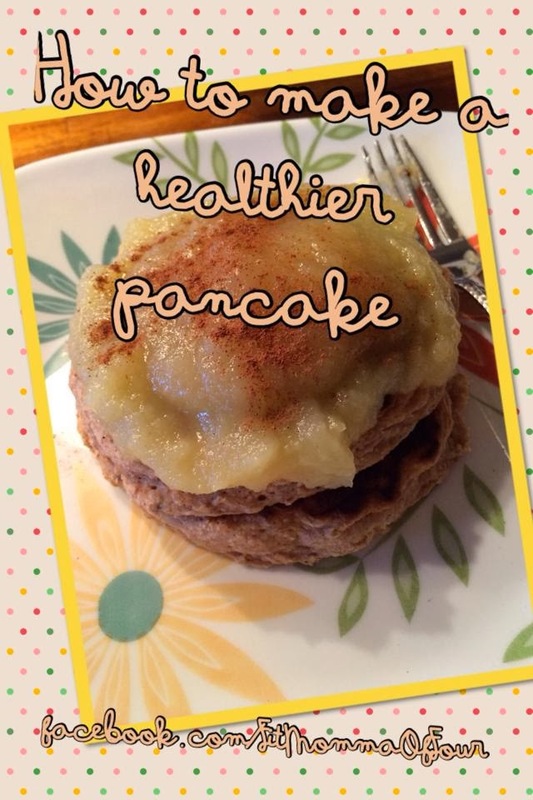 Fit Momma of Four: Healthier Pancakes for the whole family! Healthier Pancakes for the whole family! We have had a lot of snow days this winter, allowing us many more leisurely mornings than normal. When we have extra time in the morning I like to make the kids a special breakfast. A family favorite in our house is PANCAKES! This morning I whipped up the tasty cakes above & everyone gobbled them up. Here are my tips to make your pancakes healthier. How to make a healthier pancake. *Make your own! Skip the pre-made mixes. You only need a few simple ingredients to make a great pancake. *Use whole wheat or another alternative flour (spelt, almond, quinoa). *Replace oil with unsweetened applesauce. It will eliminate fat, add fiber & a natural sweetness. *skip the added sugar. If you want to add a little sweetness to your batter add a little raw honey or Stevia. *Rethink your toppings. Throw away your brown corn syrup in a log cabin shaped bottle. Get some pure maple syrup (a little will go a long way) or try something different! Unsweetened applesauce with cinnamon, a drizzle of raw honey, fresh fruit, fruit juice sweetened spread, clean eating apple butter...there are tons of healthy alternatives! Click here for my favorite clean eating recipes! Tips for a HEALTHY weekend! 21 Day Fix, is this the new workout for you?